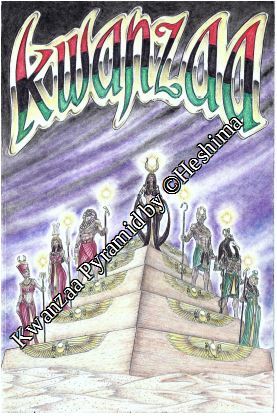 We offer you these beautifully detailed Kwanzaa cards made by Insurrectionist Artist Heshima. 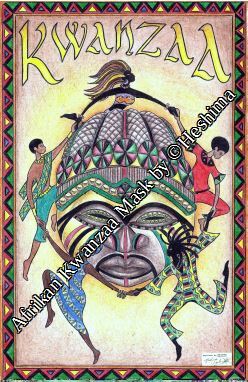 Kwanzaa is a holiday celebrated for unity, togetherness, cooperation and healing together. Sending your loved ones a card during the Kwanzaa-time makes them spiritually included in this communal feast celebrated in the last week of the year. If you want to order our set of 4 cards (2 designs each), you can send us €5.00 + €2.25 (postage&packing), or if you are ordering in the U.S.A. you will receive these for $5.60 + $2.50 (postage&packing). 10% of the proceeds will go to a good cause. THANK YOU! ← Goddess and Angels cards!